how to change lock screen font on HTC One M8.. 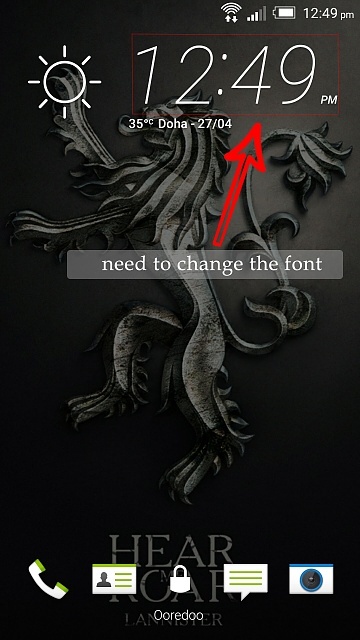 I have not figured out how to change the font for the clock on the lock screen. Pretty sure a theme you can apply affects it. You can't change it I'm afraid, you can uninstall the latest update on the HTC Lockscreen and have it back on how you used to have it prior to the update. Alternatively, you can use a 3rd party lock screen. I used one called ZUI Lock Screen, for me it blows away the stock lock screen, as you can have different fonts and layouts for the clock and even install a weather client to add to it. Plus the biggest bonus is the notifications, they are very iPhone like and that is exactly what I want when getting notifications. Try it out. it's free and won't do you any harm. I think its default settings, try a different theme, may be that work. Phone Answering w/ SPEAKER=ON !!! How do I change a correctly spelled word?